I wrote this song for myself and for other friends who have become parents, seeing our lives — and our adventures — change. It’s not always easy. But there it is. and stand to watch it burn. as the snow lay crisp around us. and cavort around the fire. as the flowers bloomed around us. and laugh ‘till they were gone. as the dawn would blush around us. and push ‘till she would go. as the leaves fell all around us. And pray that nothing burns. as the stars grow bright around us. This piece was created for Anonii, Prince of the Mistlands, and his Princess, Helga. Antonii is a friend and has been an Eastern Unbelted Champion, and it was my desire to have a song for him during his reign. It is in celebration of the Mist-Cyguna War which happens every spring. Around the swan doth turn. O would that I were there. Favor all within your sight. the young knight goes riding, his hound by his side. wishing, with sorrow, that I’d been his bride. a song to my love. off to the window to wait for a while. I dream of joining him there at his side. I dare not speak for my husband’s fierce pride. ah l’oiseau ah l’oiseau merci for bringing a song to my love. and asks why my slumber is ever in vain. ah l’oiseau ah l’oiseau wakefulness bringing with songs from above. with a score of hunters to catch its sweet songs. shall bring me a sorrow I cannot not abide. he stands as he glowers beneath furrowed brow. I see its head hanging, like it I am slain. leaving my white breast set with a red stain. placed in a jeweled casket, my heart full sore. That you shall know why you see me no more. a song of my love. The original work is in the Breton language, and the title, Laustic, is the Breton word for nightingale. This particular piece is only found in the manuscript known as Harley 978, or manuscript H.
The story is of two Barons, the lady wife of one is unhappy and loves the other Baron. They visit at a window, and the Baroness uses the excuse of the nightingale’s song waking her when discovered and questioned by her jealous husband. Her husband captures and kills the nightingale, and presents it to the lady by throwing it at her. When it hits her body, it leaves a blood stain. She sends its body to her lover in a small casket, its body wrapped in a piece of cloth embroidered with the story to explain her absence to him. He carries it as a reminder of her. Marie, whose actual identity is unknown, wrote in the 12th century. Her work focused on themes of courtly love (often tragic) with a strong Celtic influence. She lived in England but is believed to have been born in France. In the same period, courtly women who were working on handiwork tasks – particularly embroidery, or fine needlework or weaving – were said to have sung as they worked. 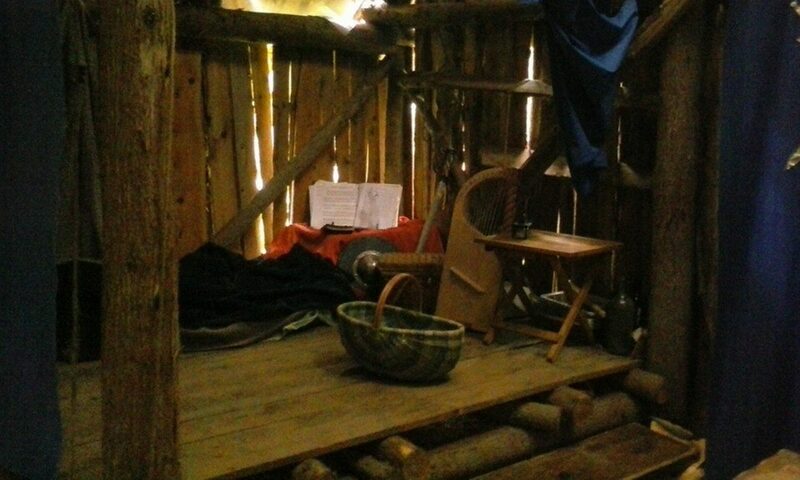 The songs which remain of this style of work were recorded in the 12th and 13th centuries and were called “chanson de toile” — song of the cloth — and often had similar themes. Frequently, the basic plot of these narratives was one of longing. A woman might be away from her beloved or perhaps married to someone who is not her romantic ideal. In these verses, the women dream of their lovers as they work and sing sad songs about their situations. The works surviving are written in Old French and were said to have been set to music, though no surviving link to the tunes survived. I felt the story by Marie de France was a perfect topic for this kind of modern chanson. The repeating verse echoes the repetitive motion of cloth work, spinning or sewing, as the rhythm of work sets solidly in. These works were also noted for having a refrain, which my version also includes. The final piece is that the woman in the story, who embroiders the cloth that will wrap the small body, may also sing a chanson de toile as she sews this very story – which is my inspiration for telling this lay in this fashion. The musical setting is my own creation. The swooping chorus is evocative of flight and the beating of wings as the nightingale flies in the forest between the lovers. Laustic (or ‘Nightingale‘ in English) takes place in an unnamed town with two barons. One baron has married a wise, refined and elegant woman, and the other baron falls in love with her. Since the latter baron has such a good reputation and lives so conveniently close, the wife falls for him as well and they spend as much time as possible standing by their respective windows, talking and tossing little presents to each other. One night, as the wife rises from bed to go to the window, her husband asks why she often gets up in the middle of the night. She responds that she cannot resist listening to the nightingale’s song, which is more beautiful than any other sound. The jealous husband then sets a trap for the bird, kills it violently in front of his wife and throws it at her. Saddened by the nightingale’s death and afraid that by no longer appearing at the window her lover will think less of her, she sends the dead bird to him with an explanation of what happened. The baron then puts the body in a casket made of gold and keeps it with him forever. 3. Burns, E. Jane (2002). “3. Love’s Stitches Undone”. Courtly love undressed: reading through clothes in medieval French culture. U of Pennsylvania P. pp. 88–118. ISBN 978-0-8122-3671-2. 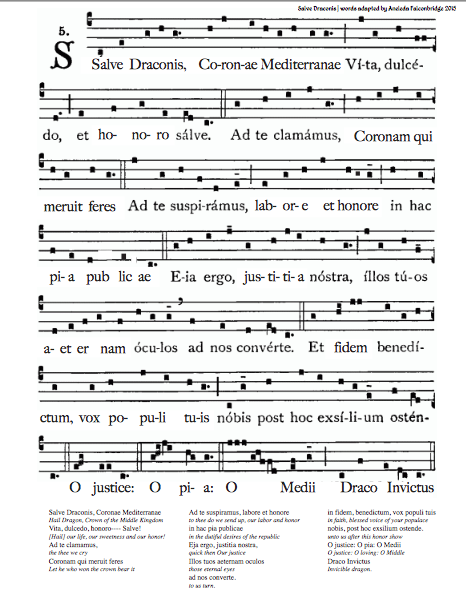 Salve Draconis, based on the Gregorian Salve Regina, for the Midrealm coronation 2015. My friend, the Honorable Lord Andrew Blackwood, was about to complete his term as the Royal Bard of the Midrealm. He had a plan for music for the coronation, a processional for his Regents. He’d asked me if I could help get the music for a particular Gregorian chant, the very traditional Salve Regina. However, soon enough it was deeply fall and the event was coming. Andrew was about to work on the piece, when he experienced a death in his family and had to travel for several days. Hearing his desperation, I offered to take a stab at adapting the piece. The Salve Regina has been chanted daily by the Cistercians since 1218 – it’s a very old piece of music. It’s a hymn to Mary, and it’s very….Marian. Exceptionally holy. And therefore, and interesting challenge to secularize. nobis, post hoc exsilium ostende. I took to the text of the piece carefully. I’m not a Latin scholar. This was very outside my comfort zone and it had a pretty quick turnaround time – just a few days before it had to go to the people who would create an arrangement of it and learn it for the Midrealm Coronation. I took the piece and looked for a concept to adapt. Fortunately, some of the Peerage oaths of the Midrealm are traditional and have supplied translations. Coronae Mediterranae / To the Crown of the Middle Kingdom. Semper Coronam ditare / To ever enrich the Crown. Talento et ingenio meo / With my talents and abilities. Sic promitto, <<Name>>. / thus swear I, <<Name>>. Et dignus esse titulo Pelicani / And to be worthy of the title of Pelican. Et cor meum juro ego, <<Name>>. / and my heart swear I, <<Name>>. I used this for inspiration. I also looked through a lot of common Latin phrases, mottoes, and other chant texts. I used a Latin verb list as well, to try to have some hope to get the right tense and use. I knew I wanted to use the Midrealm motto (of sorts) of “Draco Invictus” in the piece because of its strong connections to the people. I also wanted to be sure this was a balance between Regent and People (I am Eastern after all!) but to have it come from the voice of both. I did not name specific regents in order to make it useful on the longer term. What I wound up with was this: Here is the sheet music to Salve Draconis. [Hail] our life, our sweetness and our honor! The piece was performed as the reigning King and Queen, Ragnvalder Jonsson and Arabella Silvermane, processed into the hall toward the thrones. You can see the final format here, with transcription and arrangement by Cailin mac Aindréis and Siri Toivosdotter: Salve Draconis – New Words Only.